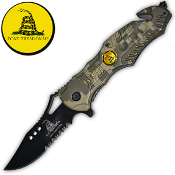 Desert Camo "Don't Tread on Me" Rescue Pocket Knife Assist Open - Razor sharp surgical steel half serrated blade with thumb stud. Handy pocket/belt clip. Strong spring assisted technology - Press the index on the back of the handle (or use the thumb stud) to engage the spring, and it "snaps" open and locks in place. Uses a liner locking mechanism that keeps it firmly locked yet allows it to be closed with 1 hand. Quality torx screw construction throughout ensures that this knife won't let you down when you need it. Handle emblem and blade read "Don't Tread on Me". The included razor blade seat belt cutter and steel tip window smasher make this a valuable rescue/lifesaving tool.